It will be unveiled in August, now confirmed. But before that, the new Volvo XC90 unveils its new security, creed of the Swedish brand. Volvo is traditionally a brand cares about the level of security of its vehicles, and has set itself an ambitious goal: zero death aboard a New Volvo in 2020. To achieve this, the manufacturer does not of course count only the passive safety of its vehicles, but also active safety. For the most dangerous element on board is not it the driver? We therefore find in the Volvo XC90 a whole arsenal of driving aids. Some already seen in other vehicles (blind spot monitoring, maintenance support queue, monitoring City Safety collision with pedestrian detection, adaptive cruise control with monitoring function in traffic (including control management), automated car parking, with 360° vision … Some have also improved, as the recognition of signs (for which Volvo indicates a wider range of accepted panels) or the more sharp anti-rollover. But there are also some major innovations. Starting with a system of protection in case of road exit. If despite the aid mentioned above, in particular helping to maintain the queue, the vehicle came off the road, the XC90 is able to detect it, and take some action. Starting with the tightening of safety belts. The front seats are also equipped with a system of energy between the seat and its attachment absorption, which provides shock absorption related to violent entry on bumpy terrain. Another novelty which complements the risk of collision-detection devices: detecting oncoming traffic at intersections with automatic braking. 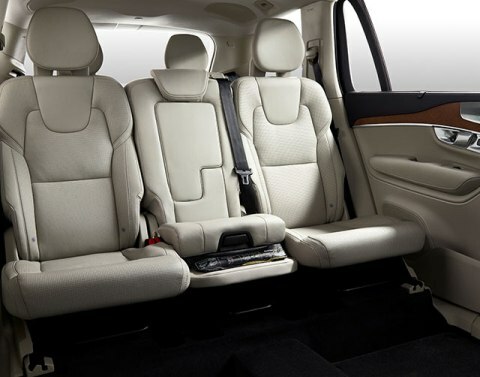 Note that the images published by Volvo lift the veil on the second row of seats, as with the current generation of three individual seats, including a central headquarters with an integrated booster seat.